A one day training was conducted by AIMA on Decoding Blockchain For Business: Present & Future Prospects. The training was held at AIMA New Delhi on 13th Oct 2018. After many technology revolutions, we are now in the midst of another quiet revolution: blockchain, a distributed database that maintains a continuously growing list of ordered records. Just as the internet was the first native digital medium for information, Blockchain is the first native medium for value and this has big implications for business and the corporation. The first major blockchain innovation was bitcoin, a digital currency experiment. The second innovation was called blockchain, which was essentially the realization that the underlying technology that operated bitcoin could be separated from the currency and used for all kinds of other inter organizational coopertations. It has become imperative for business executives and innovators to move beyond the hype and understand the business case of this technology. The challenge for managers is to have a clear understanding of the technology and the revolutionary impact it can have on their own business and beyond. 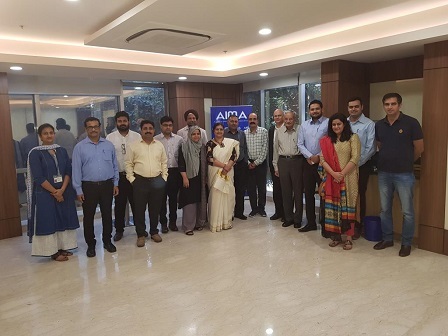 AIMA training conducted on the topic helped participants to critically understand the blockchain technology with a focus on the business value. The program integrated the basic foundational knowledge of blockchain technology with a strategic framework for implementation. By the end of the training the participants developed the ability to make better strategic decisions by utilising the Blockchain Strategic framework and case studies. The participants developed insights into the critical implementation challenges and strategies.